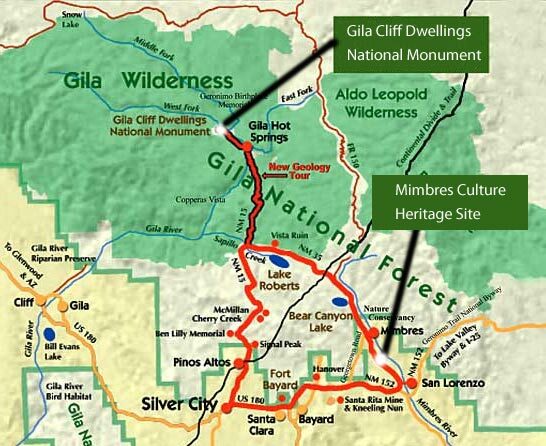 The Mimbres Culture Heritage Site is located in southwest New Mexico on Highway 35, east of Silver City, and south the Gila Cliff Dwellings National Monument. An integral part of the Mimbres Culture Heritage Site development plan is to support and encourage the use of the Site as an educational facility. Schools are invited to schedule field trips to the Site for an exciting learning experience. Indeed, any and all visitors will receive a fascinating glimpse into New Mexico's historic roots. The mission of the Mimbres Culture Heritage Site is to protect and preserve the prehistoric and historic features of the site, and to provide visitors with educational opportunities to increase their understanding of the history of land use in the Mimbres Valley by experiencing the Mattocks Ruin, the Wood and Gooch Houses, and the land itself. The acquisition of the Mattocks property was made possible by a generous contribution from Maclean (Mac) Wilson in memory of his mother, Imogen F. Wilson. Hearing about the efforts of the Grant County Archaeological Society to save this archaeological and historical treasure, Mac donated the funds to purchase the Heritage Site.